Smartphones and fitness bracelets have been familiar with for a few years now. Part of the "Digital Wellness” revolution that includes computers that monitor your pulse, temperature and other health indicators are part of gadgets that gains sophistication that are so varied and has coverage of almost every aspect of human health needs. Now comes the smart pacifier and smart rollator. Finnish startup Ouraring specializes in physical training. 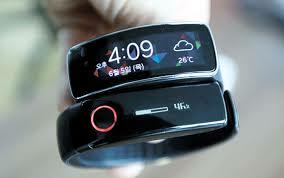 It keeps track of indicators like physical activities and even sleeping patterns. With the ageing of the Baby Boomers, healthcare services need to have to keep up with the demand for such services and at an increasing need for efficiency, records keeping and monitoring the aging population by just wearing a ring made by the startup. Lasse Leppakorpi, the founder and CEO of Beddit, a startup specializing in sleep-monitoring equipment, says new gadgets will increasingly change the role of doctors to becoming “consultants and experts” for people concerned about their well-being. The trend towards monitoring, health records keeping and early diagnosis have created a demand for such gadgets and applications. “The focus of health care will shift from treating illnesses more toward responsibility of caring for one’s health,” he said at the Slush fair, featuring a record 1,700 startups. A digital maternity package was launched by the Technical Research Center of Finland. These included pacifiers that monitors the sleep of babies, well-being and physical development and at the other end of the human life-cycle, the elderly have the smart rollators fitted with sensors and software that analyzes their daily activities and physical condition..
Jyrki Kasvi, a Green Party lawmaker, sees benefits to both governments and companies. Finland which has been affected by four years of recession, the startup sector plays an important part in trying to fill a hole in its economy because of the gap left by the sale of Nokia, the world’s former top cellular phone manufacturer. The Finnish Funding Agency, which helps companies with perceived potential to develop and compete abroad, considers health and well-being a key sector. The Slush event, which began with a few hundred participants in 2008, has grown steadily. This year, investors are coming from as far away as Australia to look for opportunities. Nicholas Young from Otsana Capital, based in Perth, Australia, said the “mood is very energetic and positive,” but declined to name any potential investment targets. The maker of the smart ring, Ouraring, believes it has an advantage over companies providing only sleep-monitoring equipment, such as smart beds equipped with sensor straps under bed sheets. “Our rings monitor when you’re asleep, when you’re awake, if you’re sitting, when you’re on the move,” said Kari Kivela, head of design at the Finnish company based in the city of Oulu, a former Nokia hub. Ouraring’s ceramic finger monitor registers activity during physical exercise, helping users plan training and recovery by linking the digital data to a cellphone app. The app analyzes the quality of rest and recovery by measuring the data from heart and respiration rates, body temperature, and body movement. During waking hours it monitors the duration and intensity of activity and time spent sitting. On Thursday, the company announced it had secured $2.3 million in funding, mainly from U.S investors, on top of $650,000 raised in an international Kickstarter campaign in September with more than 2,000 backers. The ring comes in several sizes but only two colors — black and white — and looks like a plastic signet ring. Made of a scratch-resistant ceramic compound, it slides easily onto the finger, and seems unobtrusive and light to wear. But it doesn’t come cheap, with a price tag of 299 euros, increasing to 329 euros after the funding campaign ends. Many smart watches and bracelets measure similar activities, but Kivela says that rings are more reliable because they fit firmer onto fingers than bracelets, which tend to be disturbed by wrist movements.